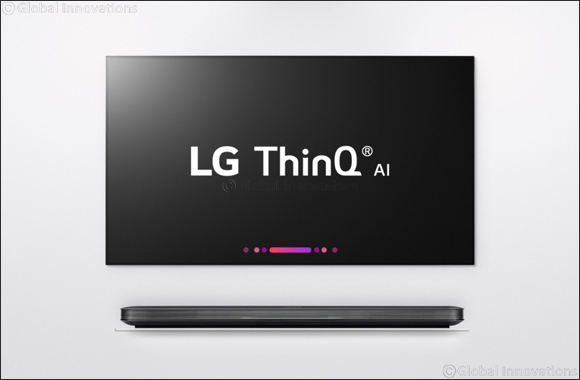 DUBAI, Jan. 4, 2018 — At CES 2018, LG Electronics (LG) will raise the home enter-tainment experience to another level with the introduction of ThinQ® artificial intelli-gence (AI) and an advanced image processor in its newest OLED and SUPER UHD TVs. ThinQ allows the implementation of hundreds of voice requests utilizing the com-pany’s own open smart platform as well as third-party AI services. And with LG’s newest α (Alpha) 9 processor powering the company’s market-leading OLED TVs, viewers will experience further improvements in what many already con-sider to be the best TV picture quality. LG Nano CellTM SUPER UHD TVs employ Full-Array Local Dimming (FALD) backlighting to provide deeper blacks and enhanced colors, as well as nuanced shadow details for life-like images. LG’s ThinQ offers an enhanced interactive experience in the company’s newest smart TV lineup, including OLED and SUPER UHD TV models by employing Natural Lan-guage Processing (NLP) to deliver intelligent voice-activated control and connectivity based on LG’s own deep learning technology, DeepThinQ. With a dramatically stream-lined setup process, viewers can easily and quickly connect to gaming consoles and ex-ternal soundbars. Users can search for information, images or videos featuring specific content by making a verbal request through the TV’s remote control such as “show me all the movies this actor has starred in” or “show me yoga videos”. LG TVs with ThinQ AI supports services based on Electronic Program Guide (EPG) to deliver information in real time or change to a channel that offers the content requested. Instruct the TV to “search for the soundtrack of this movie” or “turn off the TV when this program is over” without repeating the name of the program or entering a specific time. What’s more, customers in certain countries will be able to utilize the Google As-sistant to control smart home devices such as lights or activate third-party services. LG’s newest α (Alpha) 9 intelligent processor provides true-to-life images with incred-ibly rich colors, sharpness and depth for more realism. A core innovative element of the α (Alpha) 9 is the four-step process of noise reduction, which boasts twice as many steps compared to conventional techniques. This algorithm allows for greater finesse in noise reduction, improving the clarity of images affected by distracting artifacts and en-abling more effective rendering of smooth gradations. The processor also improves color performance, thanks to the advanced mapping capa-bilities make colors look closer than ever to the original content. The improved color correction algorithm allows for more natural colors by expanding the reference color coordinates seven-fold compared to before. α (Alpha) 9 is designed to support high frame rate (HFR) for producing smoother and clearer motion images at 120 frames per second for better rendering of fast-action content such as sports and action movies. As a result of the new image processor, 2018 LG OLED TVs can display any content at max-imum quality for a truly spectacular viewing experience. In 2017, LG made a significant achievement toward its highly ambitious vision for pro-ducing the ultimate LCD TV picture through its Nano Cell SUPER UHD TVs. By com-bining Nano Cell, FALD backlighting and the α (Alpha) 7 processor, LG’s 2018 SU-PER UHD TV offers a host of technological advantages including deeper blacks, en-hanced image rendering, improved shadow details and accurate color from wide view-ing angles. This year’s SUPER UHD TV with FALD allows for denser backlighting zones throughout the display, contrary to edge-lighting where backlights are positioned on the edges behind the TV panel. LG’s technology improves black levels and picture dimen-sions by independent control of LED light zones, improving shadow details and reduc-ing light bleeding resulting in enhanced contrast and superb picture quality.